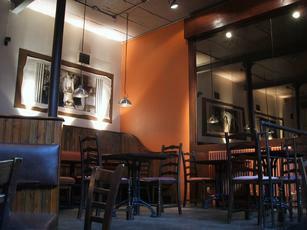 An industrial space in one of KX's back jiggers that is now converted in to a 'trendy wine bar' type place. Dashed in to escape a heavy shower and was surprised to find a couple of ales on. Tried the Harveys Sussex - it was crap and I left half of it. The numerous black-shirted male staff seem to be a kind of waiter/bouncer cross. Am sure it has it's followers but I ain't one of them. 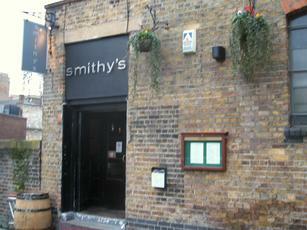 Ah, Smithy's. As a local worker, this is one of about three 'default' places for works drinks, the others being the Euston Flyer (God help us) and the Betjeman Arms (good, but pricey). It's always been over-priced for beer, but then the clue is in the designation 'wine bar', which is really what most of the punters come in for, and they arrive by the drove most nights. What ale they do have (invariably TT Landlord and Sharp's Doom Bar) is moderately well kept, but not top flight. The bar staff are really variable with an apparently high turnover, from smiles with Ps and Qs right through to downright surly. The building is worth a quick pint though: really very interesting, although you're on your own: there's no information about it. My main rating is for the drinking only. As for the restaurant, that's awful: the food is OK for lunch, and they do lunchtime offers, but good stops there. Some of the staff are unfathomably rude, and, echoing 'scarter451' below, unable to apologise. Meals arrive incomplete and take twice as long as they should to arrive (15 mins for sausage and mash?). One waitress is unable to communicate and sees every comment and question as a personal attack. And beware any voucher: the 'R-in-the-month' Ts+Cs attached to them mean the end discount is tiny and has to be fought for; they exclude drinks, VAT and service (which is added automatically). The 'caff' round the corner is quicker, friendlier and more reliable. 2/10. The manager was incredibly rude when her staff forgot they had a booking made for us, even though I had booked a week in advance. She also said that they could not use the Taste For London card for all the people eating, even though on the phone when I made the booking they said I could use the card. They finally took our order after 1 hour. The food was nice, but not worth �20 for a slice of fish and 1 potato. I went in there for the first time for a couple of beers last night. Although there were two of the three ales off, the one which was on (Timothy Taylors Landlord) was good. Service was friendly and the whole place was busy which is good to see for a Tuesday evening in the middle of May. I found that the overall atmosphere was excellent and would certainly go back there again, especially if there is football on the TV because they do not have one.